Hide deals from seller "Beach Promises, LLC"
Hide deals from category "Wedding Planning"
Limit 1 per couple. Valid on a Romance in the Tropics wedding ceremony on Saturday, Aug. 11, 2012, at Lowdermilk Park and Beach in Naples, Fla. Includes bamboo wedding arch, seashell bridal bouquet and boutonniere, photography, officiant, marriage certificate, ceremony booklet and more. May invite up to 10 guests. Subject to availability. Subject to 6% Florida sales tax on $800 purchase; must be paid directly to Beach Promises, LLC. Limited space available. Airfare not included. Wedding must be booked by July 28, 2012. Promotional value expires July 28, 2012. Say "I do" on the beach with 51% off a Romance in the Tropics wedding ceremony in Naples, Fla. from Beach Promises, LLC ($1,650 value). This comprehensive wedding package takes care of all the details, so you can relax and truly enjoy your special day. Bamboo wedding arch decorated with white satin, seashells, starfish and silk palms. Seashell bridal bouquet and groom's boutonniere. Unity sand ceremony with a take-home seashell vase. Commissioned Florida Notary Public to perform the ceremony. Keepsake Beach Promises marriage certificate. Keepsake ceremony booklet with traditional vows, customized with your names. Marriage license filed with the Collier County Clerk after the ceremony. Large white gazebo by the beach on reserve in case of rain. Beach Promises Photography will take photos of at least five poses after the ceremony. You will have access to high-resolution downloads of your photos, as well as a copyright release so you can print and share pictures of your big day. Invite up to 10 guests to your ceremony. 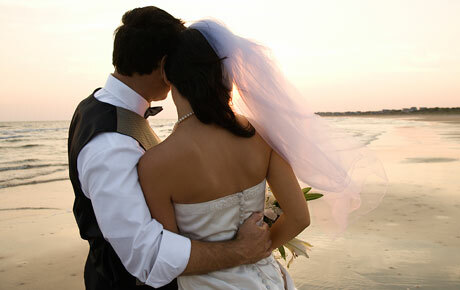 Get married in paradise with this enchanting deal. A wedding package for a ceremony on the beach in Naples, Fla.